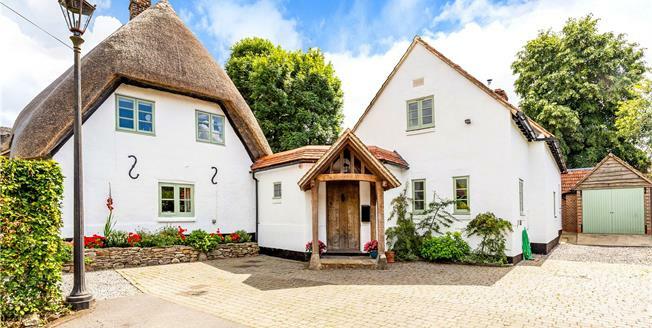 This beautifully presented Grade II listed cottage is believed to date from mid 17th century and has been sensitively extended and renovated over the years to create a wonderful family home. The oldest part of the home has been completely rethatched in 2017 and the original Forge was completely rebuilt and linked through to the cottage in 1998 by the current owners who have achieved a successful blend of character and period style coupled with modern living. The principle rooms emanate from a welcoming entrance hall, with oak flooring and large windows; Of particular note is the fabulous kitchen/breakfast room, this lovely room has an excellent range of bespoke custom made cupboards with a range of built in Neff appliances; there is a wood burning stove set into an inglenook fireplace, oak flooring and a separate pantry. The dining room has a wonderful outlook over the garden and the sitting room is a warm spacious room and features a large exposed brick and flint fireplace with a wood burning stove. Steps lead through to a stunning double bedroom or family room with vaulted ceiling and open fireplace and with an ensuite bathroom off. A study and cloakroom and a suprisingly capacious cellar complete the ground floor. There are two double bedrooms and a bathroom on the first floor of the new building and a second staircase off the kitchen leads to a fabulous large bedroom with bathroom and second bedroom, ideal as a dressing room or child’s room.